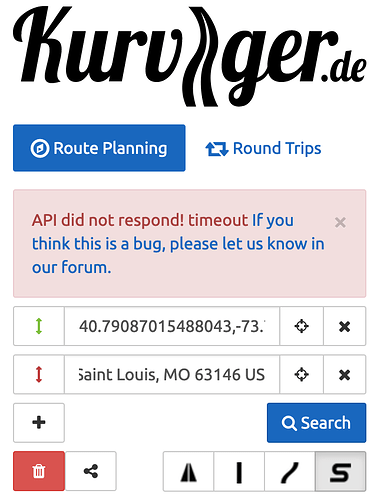 While trying to create an “extra curvy” route from my home to a St. Louis, USA hotel, searching goes on for a long time, then I get an error saying, “API did not respond! timeout If you think this is a bug, please let us know in our forum.”. Would you mind to provide an example route as url? Thank you BoldTurn for your reply. 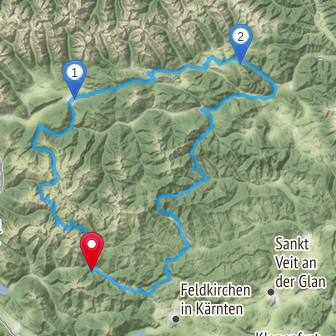 I am unable to create the route in Kurviger because it times out. How can I create a URL for you? I was able to create the route using the “curvy” setting, but not the “very curvy” setting, which is what I wanted. I am unable to create the route in Kurviger because it times out. How can I create a URL for you? If you see the time out message, click on the share button and post the link here . Usually there should be a different error message, that’s why I am wondering. You can try to place a waypoint somewhere in the middle, this usually helps if there is an issue for long distance routes (>1000km). Kurviger is your motorcycle route planner. We prefer curvy roads and slopes, while avoiding cities and highways. Plan and navigate with our app. Just letting you know that I added a “stop” on the way, Old Route 55 - and now the entire route is successfully calculated. Who would have known? Thanks for the update. You can also solve this by placing the start west of New York, instead of east. The issue is most probably that Kurviger tries to avoid driving through the greater New York area, but there is no real alternative, since you started on an island. Extra curvy tries to avoid driving through cities areas as much as possible, so Kurviger tries to find a different way and at some point you will hit the timeout. I can have a look if we can improve the error message, thanks for the suggestion.